Ah, the first fruit of canning season; the faithful strawberry. You just can't go wrong with these lovely little berries. Top them with honey or cream, and it's a dish fit for a king. The only trouble is that their deliciousness is only matched by the brevity of their freshness. Strawberries just do not last long, sometimes not more than hours. How is one supposed to enjoy their fragile and sweet flavor in the winter? The store-bought strawberries at that time if the year are bland and often tart. Freezing turns them to mush, and renders them only fit for yoghurt or smoothies. And though jam is lovely, it is always nice to have options. Hence, my trusty dehydrator. Dehydrated strawberries can be eaten as they are, or dropped into anything from cereal to ice cream. This, like so many of the best recipes, started with a happy accident. My son (being at that age) decided to investigate my dehydrator while it was running. Unfortunately, instead of returning the dial to the recommended 135 degrees for drying fruit, he set it to 145 degrees. The results are actually quite spectacular. These are like a cross between chips and strawberry candy. Crunchy and sweet, they hold up much better in cereal than those dehydrated at a lower temperature.Seal them up in a jar, keep them in a cool dark place, and they will stay fresh for a whole year. Not that they will last that long. Only use the very ripest strawberries for this recipe. Rinse strawberries in cold water. Pare to remove any damaged or bruised spots. Cut tops of strawberries, and slice into ¼ inch thick slices. 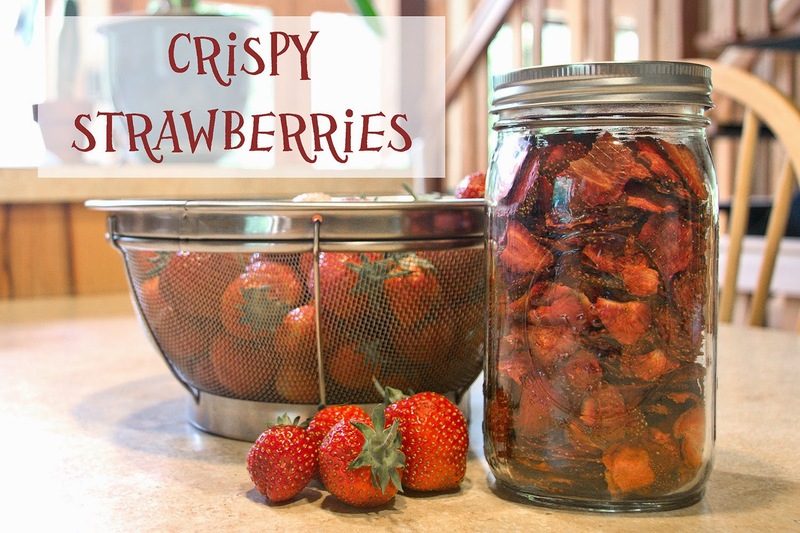 Place in a dehydrator on mesh trays at 145 degrees for 6-8 hours, or until strawberries are crunchy. Remove from the dehydrator trays, place in a quart sized Mason Jar, and screw the lid tight. Place in the back of the pantry and forget about them until January or so.